On approach, it looked like we were landing on water. The island was on one side of us, on the other, nothing but blue sea. As our Azores Airlines jet touched down, a collective sigh from those on the seaside of the plane. What a way to make an entrance. It was, however, difficult to argue that the view on either side wasn’t stunning; verdant stretches of lush green, surrounding a sleepy city just waking from its slumber, while the Atlantic Ocean lapped at it, the runway breaking its waves before dissipating. 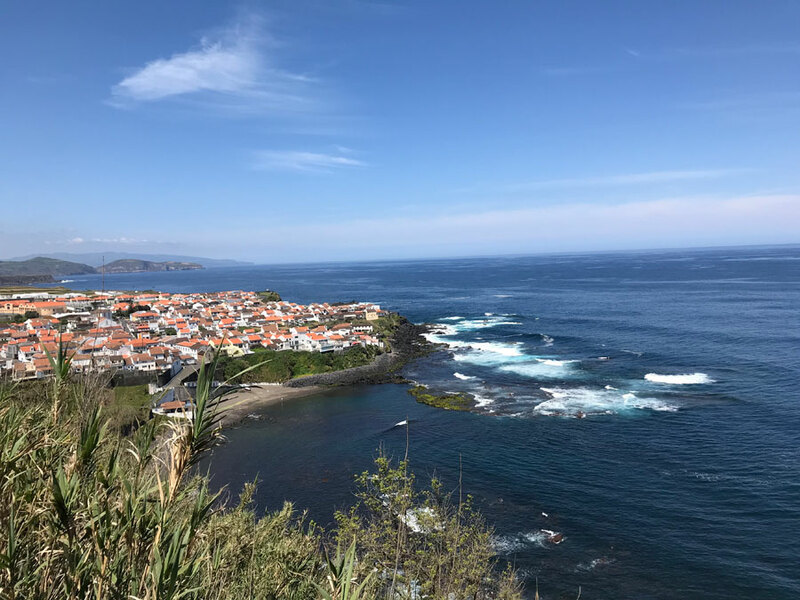 In the distance, there were what look like faint plumes of smoke rising; turns out Sao Miguel, the largest island of the archipelago that makes up the Azores, about 1,500 kilometres off the coast of Portugal, is volcanic. But these plumes are not harmful, rather healthful. They indicate underwater hot springs, a boon for wellness seekers. “I live on the most beautiful island in the world,” our guide Jaime, tells us. He’s quite dapper; his figure and his grey hair and beard a neat trim; mainlander European style yet with an islander’s swagger. His shoes, certainly not for hiking through fields or marching us around hot springs, are mint, and sent from his mother-in-law, who lives on the mainland, in Lisbon. A four-star, ocean-view room in Sao Miguel, the largest island of the archipelago that makes up the Azores, about a 5 hour flight from Toronto, can run between 50-60 Euros per night (that’s about $75 to $90), while flights, on such carriers as Azores Airlines, can be found for as low as $500 CDN. 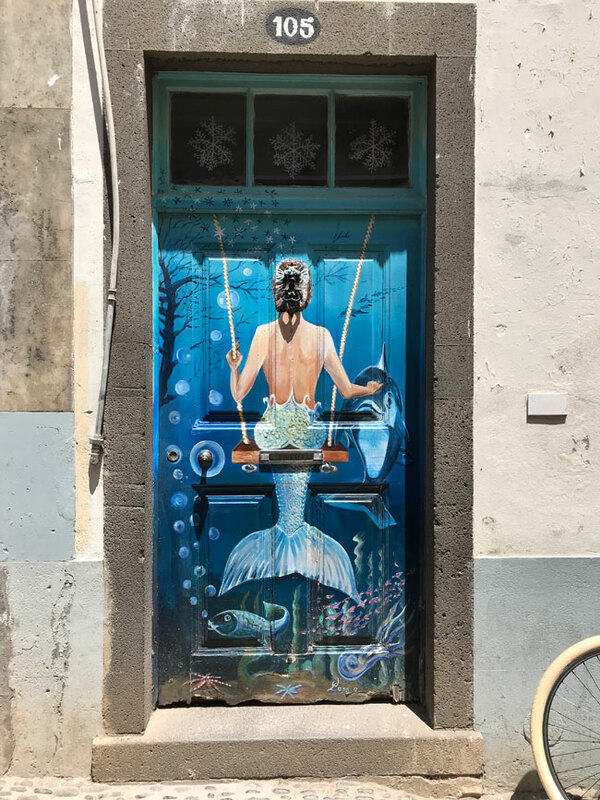 History buffs will appreciate the island’s art galleries, science and observatory museums, particularly if you’re interested volcanoes, geology and the earth, and churches – festivals of many saints are celebrated offering a good opportunity to gather with the locals to eat, drink and take in live traditional music. 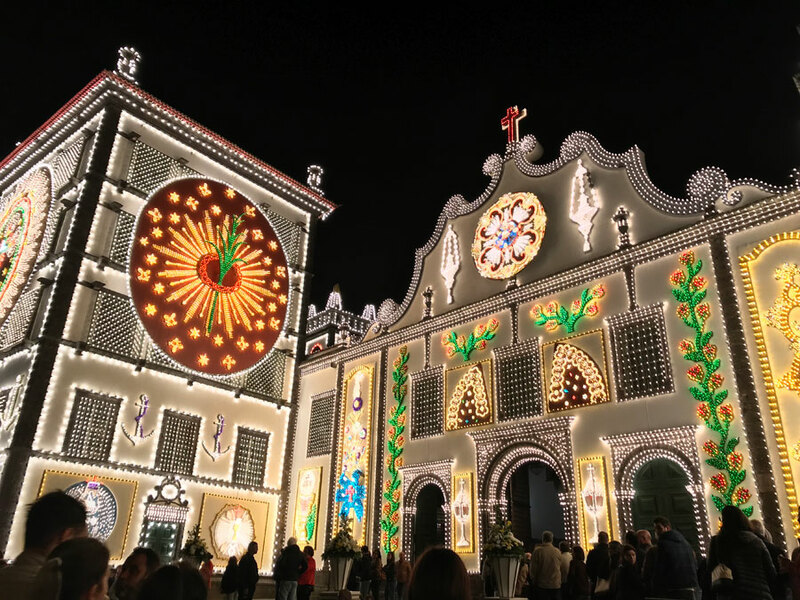 In Sao Miguel, the feast of Santo Christo in May is an annual pilgrimage for people from all over Portugal. Sidewalks paved with the classic Portuguese black and white mosaics recall mainland Europe, and the café culture is a buzz of all ages. And, the people are welcoming and happy to receive guests, something that rarely happens any more in many places in over-travelled parts of Europe (Venice, anyone?). The island covers only about 750 square kilometres, so it’s easily navigable by car. Outside town, you could be driving along country roads of France or Spain, but more well-manicured roads (and on the same side of the road as Canada). The volcanoes also provide landscapes that will get your inner adventurer going or just allow you to try something new, for less: guided hiking, for example. There are two golf courses on the island, with Furnas Golf Course ranked 13th in the top 15 courses to play in Portugal by top100golf courses.com. On the ocean, kayaking, canoeing, whale- and dolphin-watching are a fraction of the cost than the mainland. There must be something to it as visits were up 33 per cent in the first half of 2018 – that’s about 21,000 Canadians making the trip. Not surprising, as we do have historical connections. Post Second World War, and into the 1950s, there was a large influx of immigration to Canada from Portugal and particularly from the Azores. 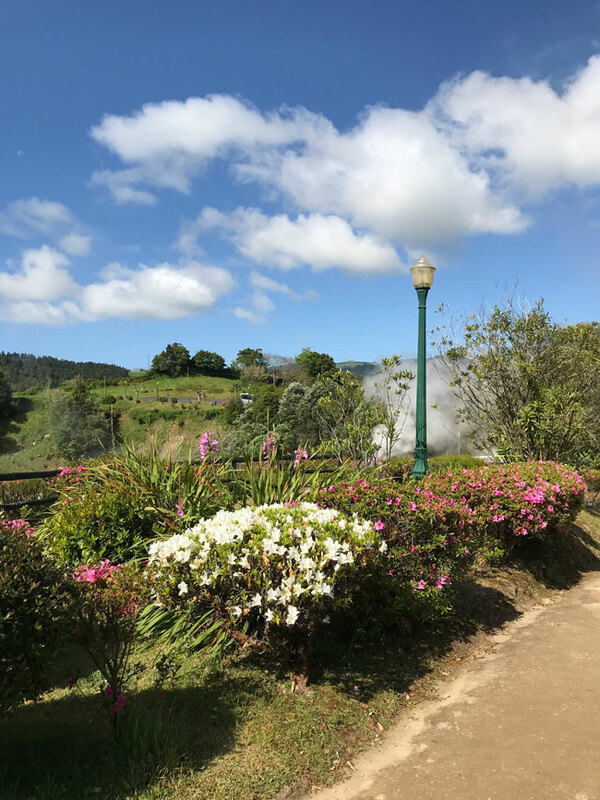 We bust the jetlag with an overnight stay in the hot-spring rich town of Furnas, where hotels are built to take advantage of the therapeutic waters. 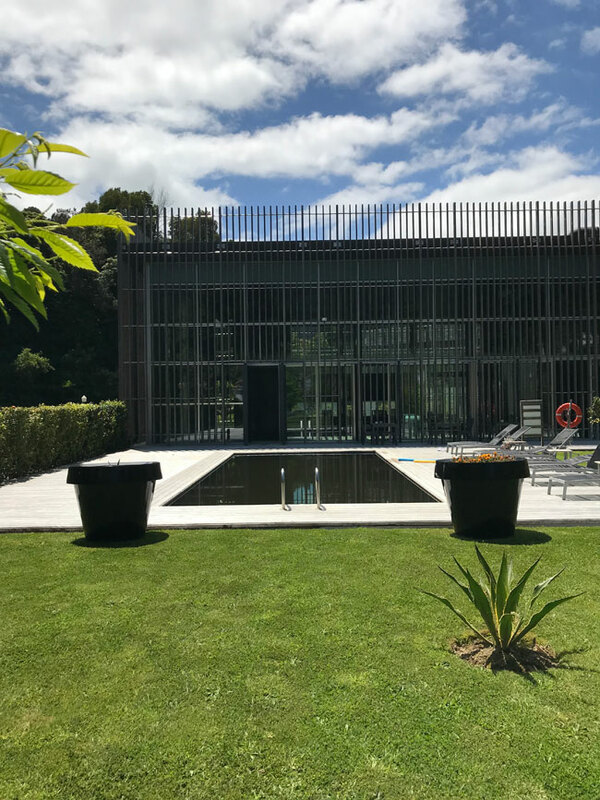 I’m floating in the hot springs pool at the Furnas hotel; it’s one of the wonderful things about this mineral rich water – you’re buoyant. It’s a calm, soothing effect that allows the mind to wander without the worry of going under. It’s early May, and it’s warm enough to spend a few hours outside by the pool; the sun not quite at her full summer power, but bright enough to just feel good. “It’s like this all the time,” Jaime says, when I remark about the glorious weather. Did I mention that I could spend the winter here? Average temperatures over the year hover around 20C or 68F, with January the coldest month, with a mild 10C, or 50F, average (daytime in January, February and March see about 14 degrees C, with no more than about 12 days of rain during the month), and August being the hottest month, at about 24 degrees C.
The Terra Nostra park and its botanical offering has been a destination since the late 1700s, and is accessed through the lobby of a modern hotel of the same name. Admission is down the hill – it’s a valley, part of a crater that is dormant, and it’s also a public thermal baths facility. 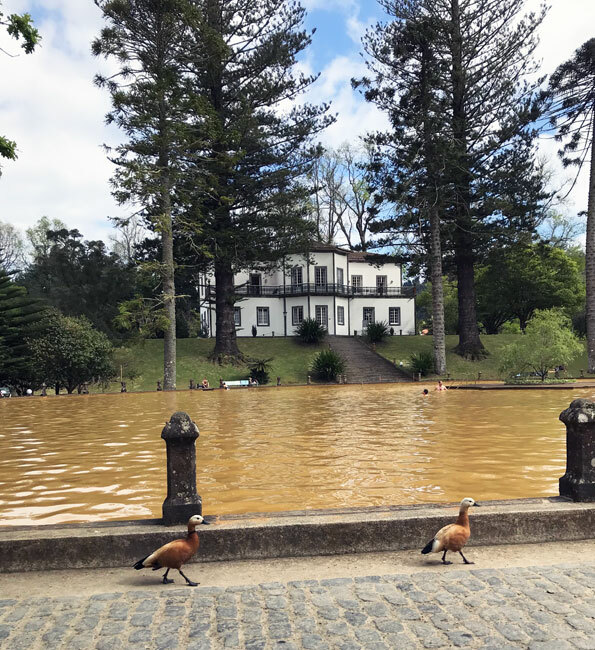 There are bathers dotting the surface of the khaki-green pool, who come here weekly to soak up the health of it all – its iron-rich waters, a balmy 27 degrees C all year round, have been credited with the treatment of everything from rheumatism to obesity. The islands, recently named the most sustainable destination in Europe by Green Destinations, are also home to a sophisticated dairy and beef industry, where the cattle are grass fed, antibiotic and hormone-free; the cheeses made here are award-winning and coveted by Michelin starred chefs. The climate also allows for tea plantations – the only ones in Europe – with green tea in abundance, grown pesticide free, and the locals take this tea everyday, understanding its antioxidant and health-boosting properties. Science tells us that being in nature is a longevity booster for the mind, body and soul, and here, the body-mind connection is evident. 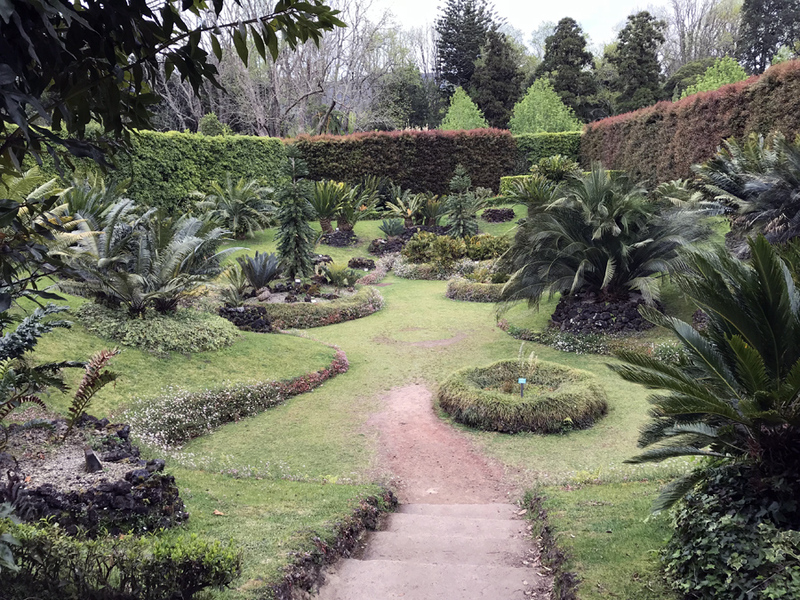 The gardens beyond the thermal pool have been planted and neglected and expanded over the generations, since 1775, to the current hotel owners, who employed a Kew-trained gardener to come from the famed English Royal garden to restore it in the 1930s. Nearly 85 years and 12.5 hectares later, it’s a sprawling collection of spectacular blooming shrubs and towering trees from all over the world – English Oak stands with Canary Island Palms and Gingko Biloba, among 3,000 other species – a Camellia-lovers dream garden bursts with colour and fragrance, while wild garlic snapes and their petite white blossoms carpet the ground beneath – and infusing the air with a scent all their own. I could smell them before I could see them. Tip: The hideaway cycas valley is a tiny delight. A mix of what look like miniature palms and ferns, the garden is hedged in, and a riot of every green you could envision. Knobby, gnarly trunks give way to fronds and quill feather-like branches; walking around and over these plants rather than under them, is sort of how I imagine Gulliver felt. The whole island is a plot, but a plot with a purpose. Hydrangeas, which we think of as decorative, line the roads, and act as a natural windbreak from the ocean breezes; azalea and camellia add to the riot of colour and prop up the borderlines between farms’ fields. 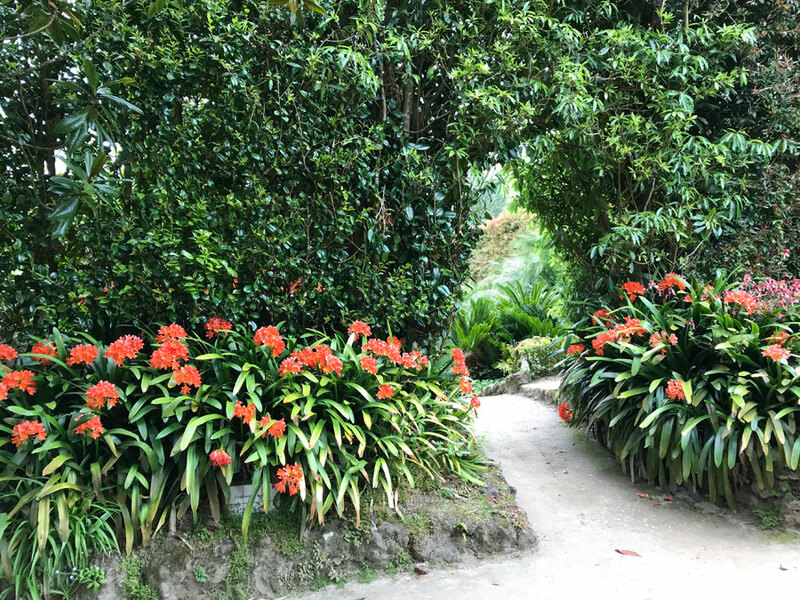 “We have about 60 unique plants on the island,” Jaime says, “but about 700 species of plants, trees and shrubs grow here, all year round.” The Azores were a natural pit stop to and fro between Portugal, the Caribbean, Bermuda and points beyond, and many flora species – along with sugar cane – arrived via ships. Native juniper (cedar), heather and laurel sidle up nicely with plants from Japan, Brazil and as far as New Zealand. Birds, too, have made the islands a stopover during migration season, and some, not seen anywhere else in the world, such as the Azores Bullfinch, have made it their permanent residence. “Let me introduce you to the twins,” says Jaime. We’ve been on a road trip, stopping to snap one Instragrammable moment after another – with cliffside ocean views, colourful villages and black and white dairy cows that are just part of the scenery here, this place is always ready for her close up. As we reach the top of the road, not one, but two lakes come into our periphery. “Look closely,” he continues. As the clouds shift and reveal more sunlight, the lakes begin to change. One is deep blue; the other, a green just shy of emerald. 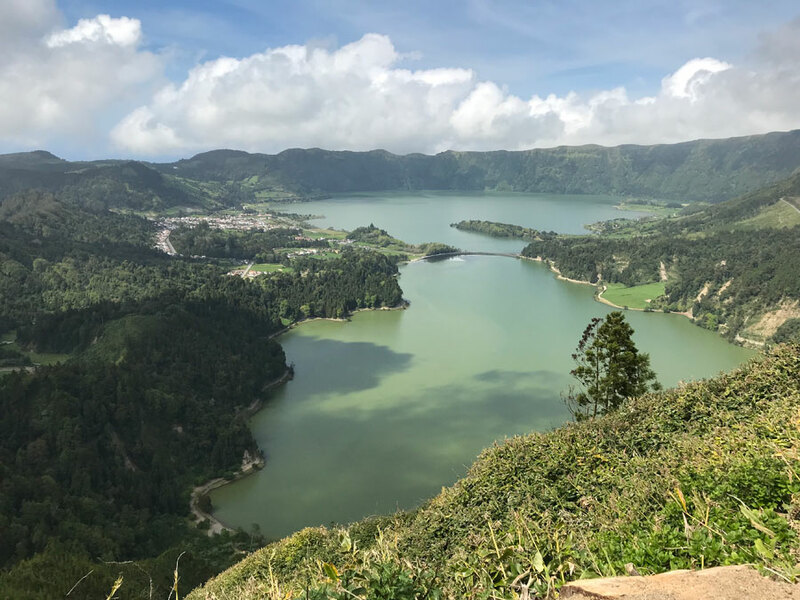 The “twins,” as Jaime puts it, are actually Lagoa Azul and Lagoa Verde, not quite identical, but from the same mother volcanic spring at Sete Cidades. Jaime’s origin story of the lakes is slightly different. Local legend, he says, tells a tale of a princess and a shepherd who fall in love – scandalous and forbidden. Their tears of sadness filled the lakes, blue and green. 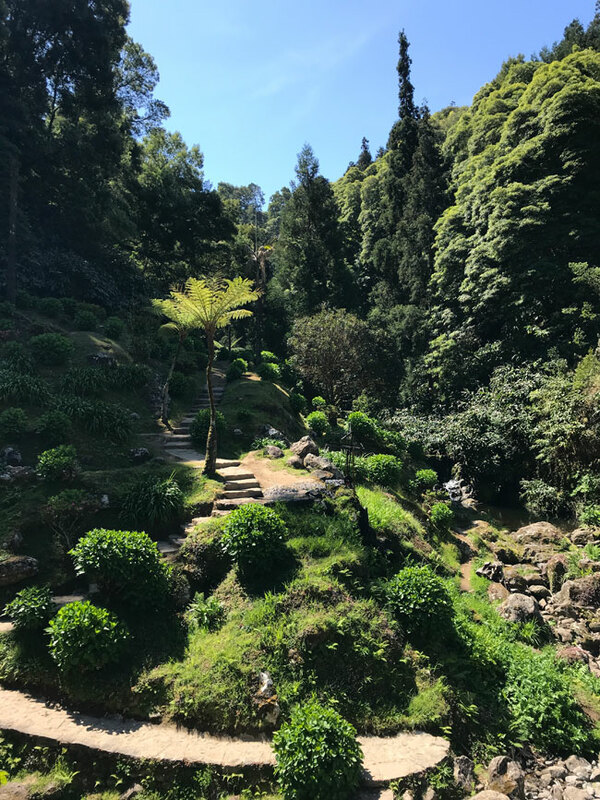 From Sao Miguel, Azores Airlines offers daily flights to many of the Portuguese islands, including Madeira. 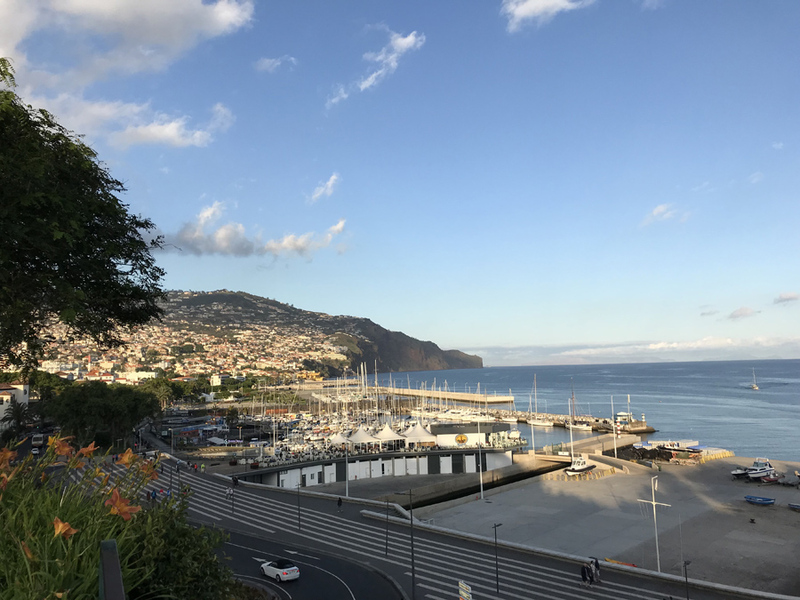 We’ve landed in Funchal, the capital of Madeira, and the view from the plane has the Atlantic lapping at the runway on one side, but on the other, stacked terraces carve out a dramatic swath in the hills of this island famous for its Madeira wine. Grapes and other fruits and vegetables grow in harmony on the steep hillsides, and act as a dramatic backdrop to a vibrant capital city. 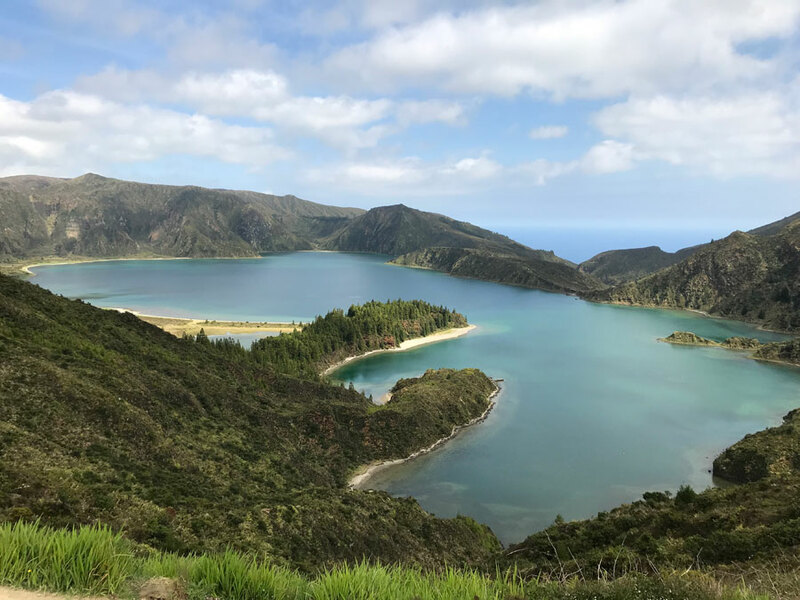 The island is closer to the coast of Morocco than it is Portugal, and there’s a decidedly lovely binding of Atlantic European culture and Northern African climate here. 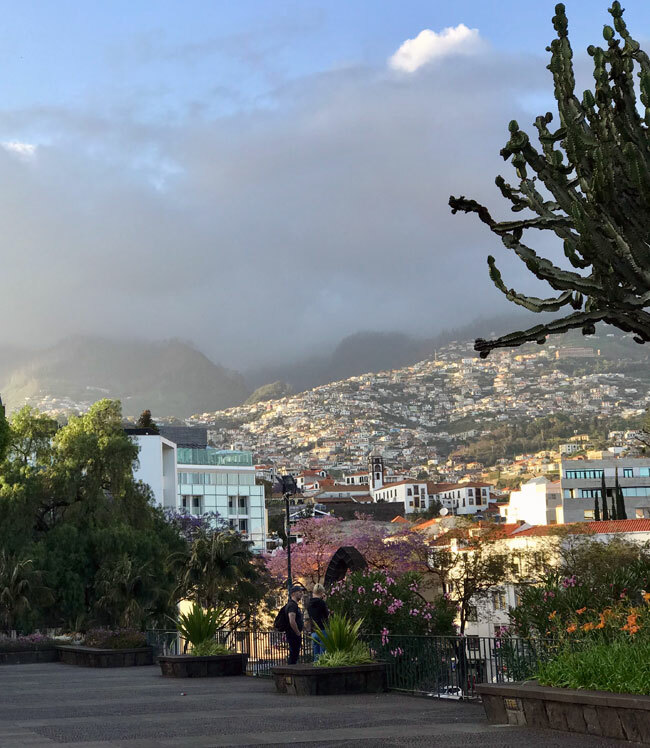 It’s also the birthplace of soccer star Cristiano Ronaldo, and you could say it’s a bit of a mirror: home-grown good looks, a depth of athleticism and a global reputation. Flowers, blooming shrubs and gnarled-trunk trees line the streets, and public parks and squares are more flora than they are concrete; another boon for the wellbeing of the mind. Rooms in the Hotel Pestana Casino Studios are geared toward those who want to stay more than a few days (I would suggest at least two weeks), and within walking distance of main squares, restaurants and historic districts. There’s a little efficiency with a kettle, microwave, mini-fridge and hotplate, but the best is the balcony, with a view of the bay. It’s part of a group that’s co-owned by Ronaldo, who’s banking on the temperate Portuguese climes as a tourist and snowbird attraction (pestana.com/en/hotel/pestana-casino-studios). Hiking is the new yoga, as weight-bearing exercise has been key to the longevity of our bodies, plus, heck, some of us are just not meant to bend into a pretzel. Out of the city, hiking is the key sport and health driver. 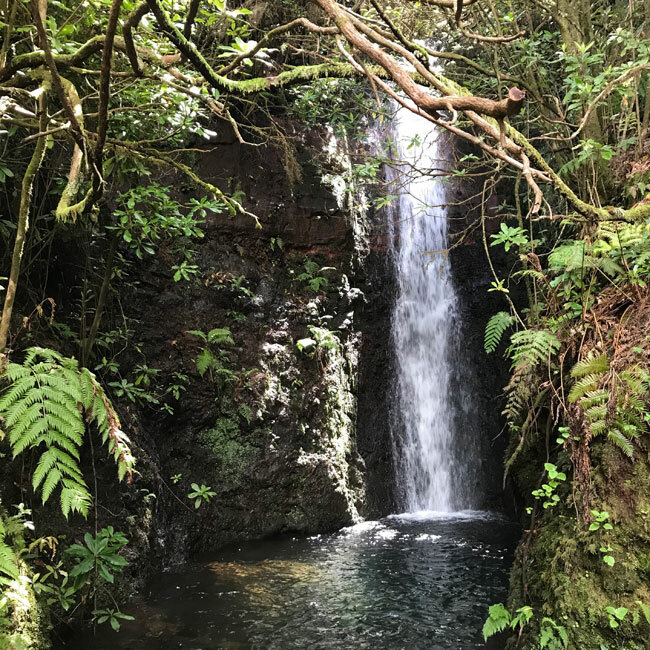 The mountains have given way to so many streams, they’ve been turned into aquaducts, or levadas, to bring water from the west to the east of the island. The Moors brought the technology to Portugal, and the brilliance of it stuck. 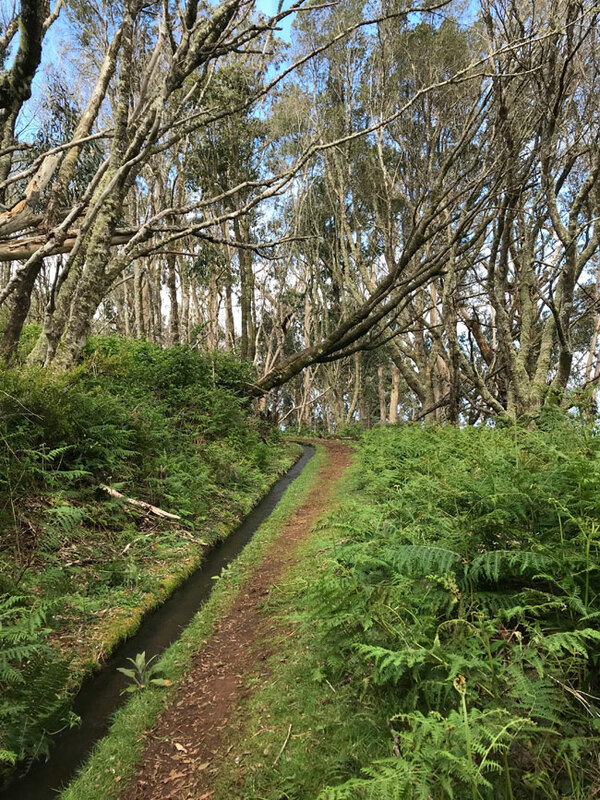 The design allows for fresh water to flow to the farms and the cities, while the swath the levadas have cut through the hills act as natural hiking trails that are well-marked, from easy to extremely difficult. 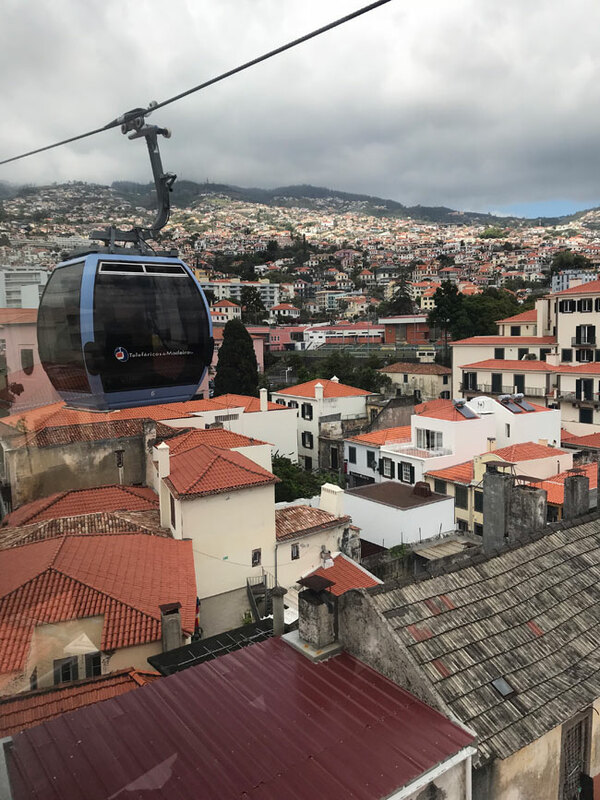 For the best perspective on Funchal, a ride on the gondola, the Madeira Cable Car, is the only way to go. Its trajectory, about 3,200 meters, takes about 20 minutes. The harbour, which plays host to cruise ships and white-sailed boats – and a world-famous New Year’s Eve party that even out does Sydney, along with stretches of walking paths for seaside strolls, also paved with the traditional black and white mosaics for which much of Portugal’s sidewalks are famous. At the top, an even greater reward: The Monte Palace Gardens. 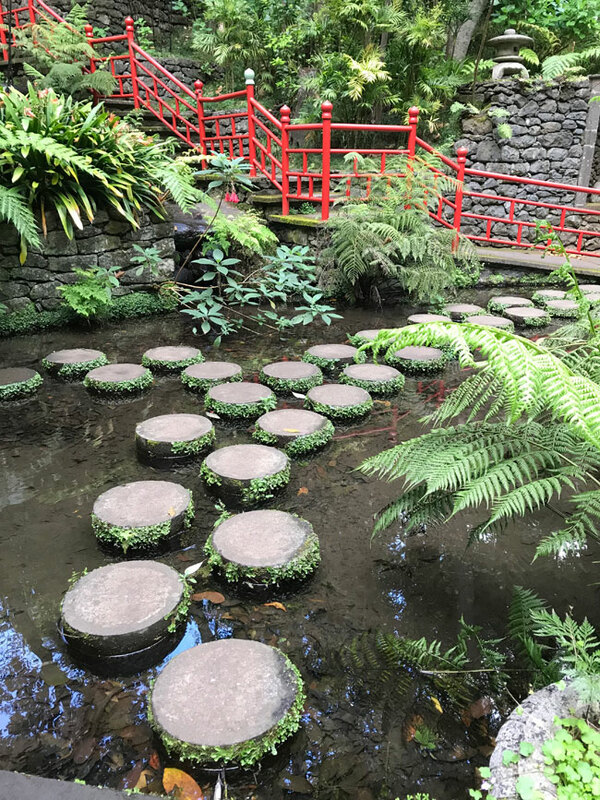 The owners had a thing for mixing histories and cultures; hundreds-of-years-old tiles (Portugal is also famous for its hand-crafted and colourful ceramics) line the stonewalls, telling the story of how Madeira was settled, while framing exquisite Japanese-style gardens enhanced by neoclassical statues and modern – think Mondrian – sculptures. From here, the only way is down – a very steep decline. Or, take the sledge car. Back in the day, the rich and influential Madeirans who lived in the tony neighbourhood of Monte wouldn’t have dreamed of walking down. When I say sledge, I do mean sledge. Shaped like a sled, make of wicker, a basket with seating for three. The vehicle is propelled by gravity and a pair of runners who pull and steer you down the hill on long ropes. 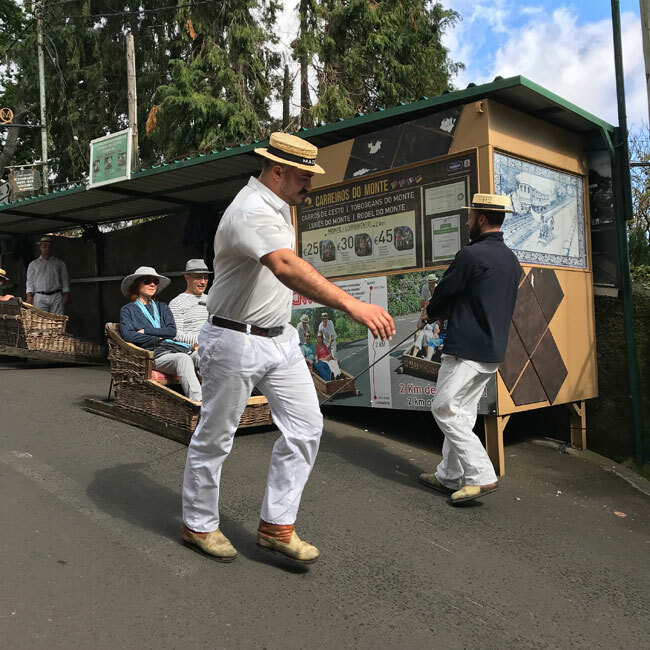 They’re all ages and we had what could have been a father and son team running us, with the look of landlocked gondoliers, if you will, wearing straw hats, navy jackets and white pants. It’s surprising how fast we actually go. The wind in my ears, my hair wild, I laughed so hard, I was crying. When we reached the bottom, I felt a burst of joy; that healthy feeling you get after a full-on belly laugh, metabolism boosted, calories burnt.